It’s hard to imagine an industry by which humans could have changed the natural landscape more so than through the business of getting crude out of the ground, refining it, and shipping it around the globe. Which makes the oil industry a perfect subject for the Center for Land Use Interpretation (CLUI), a Culver City, California-based research organization that conducts studies into the nature and extent of human interaction with the earth’s surface. And where better to examine what oil hath wrought than in Texas? Beginning on January 16th and running through March 29th, the CLUI will exhibit just what it has learned in the Lone Star State with Texas Oil: Landscape of an Industry at the Blaffer Gallery, The Art Museum of the University of Houston. The research on display at the exhibition was gathered over the past year while the CLUI acted as the University of Houston Cynthia Woods Mitchell Center’s first artist-in-residence. 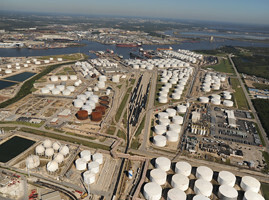 The show will open with an aerial video, picturing fly-by views of the expansive stretches of the region’s oil refineries. 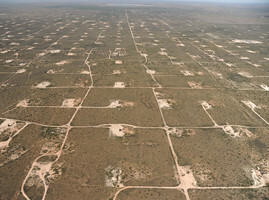 In addition to this projection, the gallery’s walls will be decked with photographs and texts that describe many different sites across the vast state, from west Texas oil towns such as Odessa and Kermit to petrochemical processing centers on the Gulf Coast. 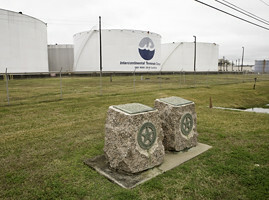 The CLUI’s photos pay special attention to places where evidences of previous uses or historical events underpin the oil industry’s installations. 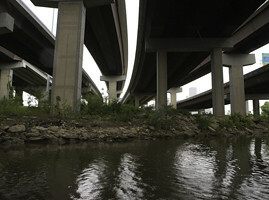 And if you do find yourself in the Bayou City this spring, be sure to call the Mitchell Center’s hotline (713-743-5548) for a boat tour of Buffalo Bayou.